First printing per "A B C D E" number line. The printing date is not stated. The only clue is 1988 copyright dates for some material. The introduction essay is signed "15 June 1987." Amazon.com reports March-1988. However, Locus1 gives April-1988 and so that date was used for this publication record. There is no stated artist credit. A signature is not visible either. 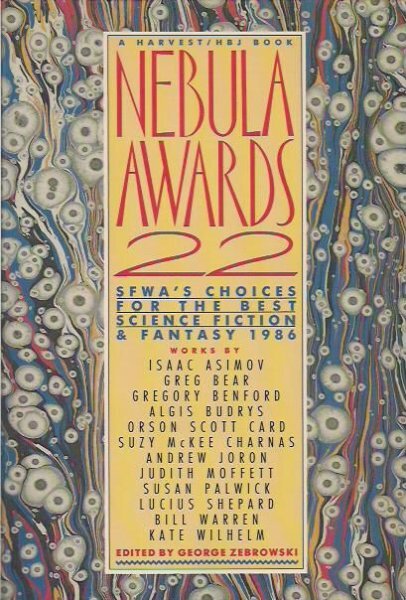 The back cover has "Cover Design by Vaughn Andrews" which ISFDB credits for as the cover artist for the Nebula Awards 23 and 25 anthologies. Page 320 has Rhysling Poetry Award Winners, horizontal line, and then Susan Palwick / Andrew Joron. However, it's clear that the lead paragraph, which is about the award in general, is written by someone else. This is followed by bio essays for Susan Palwick and then Andrew Joron. Their poems then follow. Thus the Rhysling Poetry Award Winners introduction essay has been entered as by uncredited.